CORPUS CHRISTI, Texas — A Pennsylvania minor league baseball team has cut an outfielder after a Texas police department released a video of a domestic violence incident for which the player completed a probationary sentence. The Lancaster Barnstormers of the independent Atlantic League announced on their Facebook page late Tuesday that they had released 24-year-old Danry Vasquez. That was after Corpus Christi police released to KRIS-TV in Corpus Christi security video of the Venezuelan native hitting his then-girlfriend multiple times in August 2016 at Whataburger Field, home of the Corpus Christi Hooks baseball team. 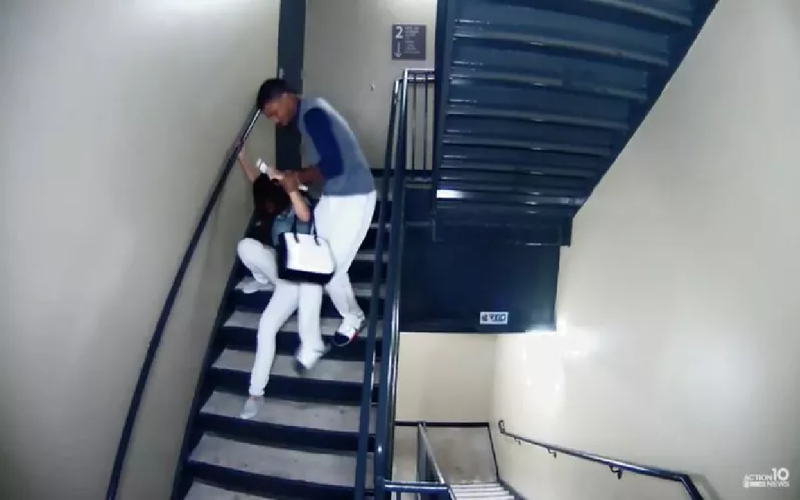 Vasquez can be seen backhanding the woman in the face three times, hitting her in the head, and pulling her down stairs by her hair. Twice, Vasquez retrieves her glasses, which fell when he struck her, and places them back on her face. At the time of the attack, Vasquez was a member of the Hooks, Houston's farm team in the Double-A Texas League. Major League Baseball suspended Vasquez indefinitely; independent leagues aren't subject to MLB's authority. Vasquez's attorney, Lee Cassidy, told KRIS that the woman in the video did not wish to press charges in the case but Nueces County District Attorney Mark Gonzalez would not drop the charges and Vasquez was allowed to enter a pre-trial diversion program offered to first time offenders. "In this situation, the two people who were involved were very young," Cassidy told the station. "They had been together as boyfriend and girlfriend since he was 16 and she was 14 in Venezuela. With those considerations, it was decided by the District Attorney's office, that they wanted to put him under supervision and not dismiss the case." Gonzalez told KRIS that after Vasquez completed all requirements of his probation - including attending classes and paying a fine - he "had to dismiss the case." "We just allowed this individual to hopefully get the training and education so he wouldn't continue to assault people he has relationships with," said Gonzalez. He continued: "I'm hoping Mr. Vasquez will be the poster boy for our program and never hurt somebody who he's in a relationship with and only time will tell."